Unlike many small cities today, Saratoga Springs features a lively, economically vibrant downtown. It hasn�t always been so, and during those hard times�from depressions and world wars to recession and suburbanization�Saratoga�s citizenry fought back. Programs for revitalizing the downtown business district date as far back as 1873, when the great hotels were rising along Broadway for the throngs of tourists who came for the high society, the waters, the horses, and the gambling. But efforts that began a century later, in 1973, seemed to herald a new era for Saratoga Springs, marked by community concern and collaboration that has continued into the twenty-first century. Skidmore College, which occupied buildings just east of Broadway for its first half-century and was rebuilt at the north end of the street in the 1960s, has always played a role. The college and the city are synergistic: Saratoga�s lively downtown scene has helped attract generations of students to what is arguably the best college town in the Northeast, and in turn those students help enrich the city with volunteerism, involvement in local politics, and of course spending. Skidmoreans and Saratogians alike share an enthusiasm for shopping, eating, strolling, and partying downtown. Stores like these shared Broadway with majestic remnants of the city�s Victorian heyday, including hotels like the 824-room Grand Union. But in 1953 the Grand Union was demolished, and a series of fires in the 1950s and 1960s� one of which took out an entire row of buildings on the east side of Broadway�sucked the life out of the city center. Saratoga Springs began a steep economic decline. By 1973 the downtown vacancy rate had reached 50 percent. The opening of the Pyramid Mall in 1972 in the neighboring town of Wilton represented a tangible threat that prompted Saratogians into action. Business leaders, residents, students, preservationists, city planners, and historians banded together to save the downtown business district. 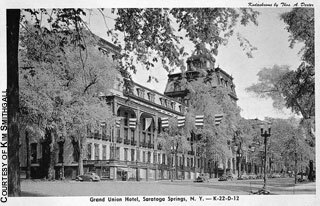 They began with a vision for revitalization called the Saratoga Plan of Action (SPA). Saratogians mobilized to develop their city in the context of its glorious past. Says Joe Dalton, longtime president of the Saratoga County Chamber of Commerce, �The Plan of Action was a real grassroots effort. We involved school teachers, business owners, entrepreneurs, housewives, students, everyone who wanted to be heard. We interviewed every tenth registered voter in the city and every fifth senior citizen in both the Stonequist Apartments and the Saratoga Retirement Center about development issues. Every tenth Skidmore student was also surveyed.� Surveys also reached 10 percent of Broadway residents and 53 percent of downtown merchants and professional organizations. Kathleen and Noel Smith recently turned a derelict Victorian-era rooming house into the upscale Saratoga Arms Bed and Breakfast. �This tree-planting was a real renegade approach,� according to Bristol, �because city government simply wasn�t interested at that time.� As hoped, the move caught the attention of city politicians. Additional public funds allowed the continued development of the Plan of Action. The final Plan of Action set priorities for improvements in building facades, sidewalks, parking, maintenance, and promotion. With residents willing to make an investment in Saratoga Springs, the city council got behind redevelopment too. 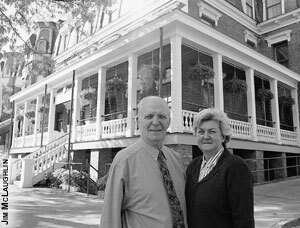 Formed in 1977, the Saratoga Springs Preservation Foundation worked with the city council to designate historic districts within which buildings could be saved from demolition. With foundation guidance, the city used a $500,000 federal grant to improve 85 percent of the building facades on Broadway. 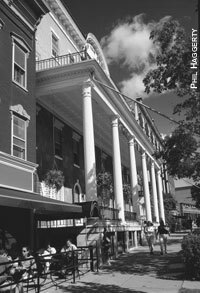 Also in 1977 the city council approved the creation of the Design Review Commission to help maintain Saratoga�s appealing architectural character. The commission reviews proposals for renovations and new construction to ensure that designs are compatible with surrounding structures. Also, downtown property owners approved the creation of a special-assessment tax district where property taxes were increased by 6 percent, with the proceeds used exclusively for downtown redevelopment. In the end, more than a dozen community organizations, scores of business people, and thousands of volunteers prevailed. Broadway began to reemerge from its ashes. Residents, historians, business professionals, and politicians alike agree that Saratoga Springs still has what it takes to win such awards. Brook Hobson, recent executive director of the Saratoga Springs Preservation Foundation, agrees. �Saratoga is such a livable, walkable, safe, and manageable city. As downtown flourishes, residential and commercial growth brings new challenges and concerns. To monitor and anticipate trends, a nonpartisan group of Skidmoreans and Saratogians is compiling basic data to help inform the many studies, debates, and votes on issues from education to transportation to development. This Skidmore-Saratoga Study Group, directed by Thomas Lewis, Skidmore�s Quadracci Professor of Social Responsibility, maintains a Web site with figures from the 2000 census and other sources, showing, for instance, that the rate of growth in the city�s population (currently about 26,000) has slowed in recent decades�still setting it apart from many cities in upstate New York, which have typically lost residents in the last ten years. Preservationists, businesspeople, and government leaders helped support the Saratoga Arms project, as well as other Broadway hits such as the J. W. Pfeil building opposite Washington Street. It opened in 1997 with an Eddie Bauer store at ground level and offices upstairs. Across the street, in place of the unappealing Woolworth�s strip mall (formerly the site of a Grand Union supermarket and, before that, of the Grand Union Hotel), a complex called Congress Park Centre began to take shape in 1997, with a Kinko�s copy center, Rent-A-Center, and office space. The second structure in the block �on a much grander scale�is now rising and slated to open later this year with apartments on the upper floors and retailers Banana Republic and the Gap at street level. Lofty goal: All-time top scorer Brian Culkin '01 takes flight above the Hartwick defense. Dalton agrees. �Stores like the Gap, Banana Republic, and Eddie Bauer can generate traffic that downtown Saratoga doesn�t normally attract��including Skidmore students. So far, the franchises and home-grown commerce seem to be coexisting. Coffeeshop business is perking at both nationally franchised Starbuck�s and locally owned Uncommon Grounds. And Saratoga�s own Putnam Market and Wine is also thriving at 433 Broadway, a former pedestrian stairway between buildings where local developer Thomas Roohan built a new structure in 1999 (and had the building�s ceramic sign crafted and fired at Skidmore by Jill Fishon-Kovachick �81, Darren Prodger �93, and visiting instructor Doug Klein). Whether it�s about chain stores, architecture, parking, truck traffic, or green space, Saratogians don�t hesitate to voice their opinions about their downtown, and that sense of ownership has kept the city center strong. Kim Smithgall is a communications specialist and freelance writer, and Kathryn Gallien is a part-time Scope writer; both live in Saratoga Springs. Chain stores may be colonizing Saratoga Springs, but many local firms are holding their own�and then some. One secret to their success is fresh ideas and solid research, courtesy of Skidmore seniors enrolled in town-and-gown�devised independent studies in entrepreneurship. With their Caroline Street rehab project looming behind them, Molly Carleton �01, Peter DiCarlo, Leslie VandenHandel DiCarlo �79, and Jane Bowie �01 meet to plan an ambitious new tavern and caf�. 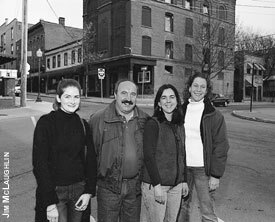 Restaurateur Leslie VandenHandel DiCarlo �79, owner of the Springwater Inn on Union Avenue, had a somewhat more daunting project: she and husband Peter were new owners of a large derelict building that they proposed to gut, rehab, and open as an eclectic bar and restaurant complex. When they first showed their Skidmore interns through the big brick building at Maple and Caroline Streets, snow fell on them through the rotted roof. 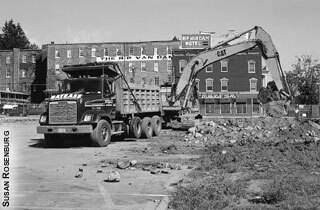 Some thirty-six Dumpsters later, the debris was mostly gone and rebuilding began. Their plan envisions a ground-floor tavern, a second-floor caf�, a third-floor banquet and catering facility, even a rooftop caf�. In an earlier business course, business-Spanish major Christine Merenda �01 and English major�business minor Molly Carleton �01 had mocked up a business plan for a bar, while business and economics double major Jane Bowie �01 had done hers for a catering firm. This spring, to help launch the DiCarlos� new venture, Merenda and Carleton researched similar taverns and clubs, and Bowie set up a spreadsheet to chart costs, revenues, and other numbers. �Because we were students asking questions, some people didn�t want to bother with us,� says Carleton. �To get them to tell us their prices and offerings, we had to pretend we were planning our wedding!� Projections and estimates were plugged into the spreadsheet, which �Leslie is pretty good at now,� Bowie grins, �though she didn�t know the software at first.� Bowie also showed DiCarlo some library references with helpful data for assembling business plans. Ditto for Cynthia Fifield �01, an art and business double major who worked with Joseph Dalton of the Saratoga County Chamber of Commerce, on behalf of the city�s Design Review Commission, which wanted to offer a list of historically appropriate house-paint colors. 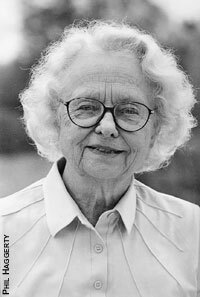 Fifield researched paint company services; then, through Allerdice hardware store, she helped persuade designers at Pittsburgh Paints to recommend color combinations for various types and vintages of architecture. Now, says Dalton, Design Review has a palette of twenty-two colors designated as preapproved. Fifield also facilitated a project whereby Saratoga�s Preservation Foundation lends citizens a digital camera to photograph their home and lets them use its computer to �repaint� the photo in various color options. Another housing-related project was a startup plan for a Web site linking landlords with student renters. Business majors Amanda Rivera �01 and Lisa Powers �01 got some leads from Saratoga real-estate agent Jenny Mirling, interviewed landlords and students living off campus, and began developing their idea for a dot-com enterprise to help orient students to life in Saratoga. (It�s a crying need, says Mirling: �Saratoga has the most inhospitable rental system! All those professors and other newcomers really deserve a better introduction to this great town.�) Though the semester is over, Powers says she�s pursuing the business plan this summer; as soon as she rounds up enough financial backing, she�s ready to create the ReasonableRentals.net Web site.